1 of 3 In a large nonstick sauce pot, combine ground beef, cinnamon and cloves. Cook over medium-high heat for 5 minutes, breaking meat apart with a wooden spoon. 2 of 3 Stir in onion, red pepper and garlic. Continue to cook an additional 5 minutes. Add drained tomatoes, vinegar and sugar. Reduce heat to medium-low, cover and simmer 20 minutes, stirring occasionally. 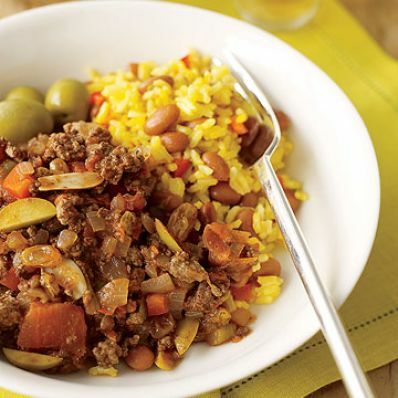 While meat simmers, prepare Rice & Beans (see below). 3 of 3 Uncover and stir in raisins, olives, tomato paste and salt. Cook 5 minutes. Serve with Rice & Beans.